A postcard sent by Private George Norman H Watson from the Auxiliary Military Hospital, Hardwick Mount, Buxton, Derbyshire. It is dated Friday, 18th March 1916. 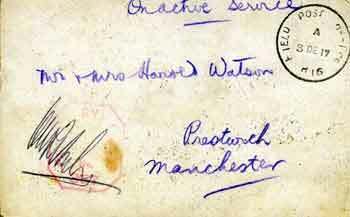 He sent it to his uncle, Harold Watson, his aunt, Mary Louisa, and cousin Hannah Louisa Madge Watson. Besides being husband and wife, Harold and Mary Louisa Watson were first cousins. Just a line to say that I received your P.C. and delighted to hear you are coming on Monday afternoon. I shall wait at the hospital until you come. All News till I see you. Love to Madge and Auntie. 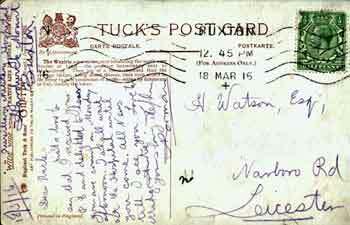 The obverse side of Norman's postcard. 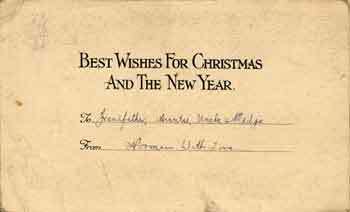 By the Christmas and New Year of 1917/18 Private George Norman H Watson was back on the Western Front again and he sent this Christmas Card to his Grandfather, Auntie, Uncle and Madge Watson. Norman's greeting to his Grandfather, Auntie, Uncle and Madge. 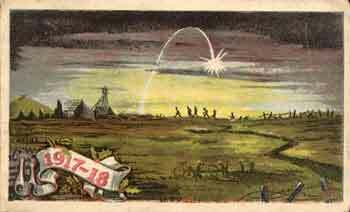 The inside of the card showing a scene of total devastation on the Western Front. A trench snakes its way through barbed-wire entanglements and on the horizon a platoon of infantrymen has just gone 'over the top' to cross 'No Man's Land'. The scene is lit by a German flare, which has just ignited above the soldiers. 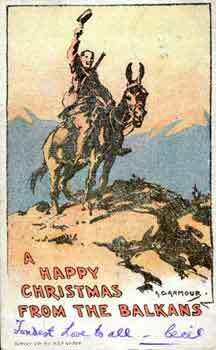 A Christmas Card sent by a soldier called Cecil (surname unknown) from the Balkans. It is dated Monday, 3rd December 1917. It was sent to Harold and Mary Louisa Watson. Cecil was on active service at an undisclosed location and the Security Stamp and signature of the Security Officer is in the bottom left-hand corner of the card. 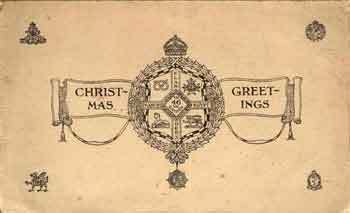 The obverse of the Christmas Card shows that Cecil was serving with No. 364 Company of the Royal Engineers. SURVEY COY R.E.B.S.F. NO 364. 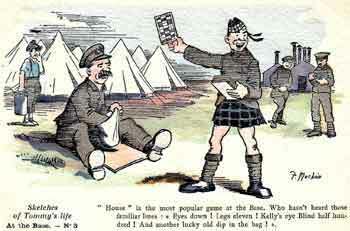 Housey-housey (or Lotto) was a popular game among soldiers during the Great War and this is shown on a postcard produced by the soldier-artist Private Fergus Herbert Elgin MacKain of the Royal Fusiliers. The caption reads; "House" is the most popular game at the Base. Who hasn't heard those familiar lines: « Eyes down! Legs eleven! Kelly's eye Blind half hundred! And another lucky old dip in the bag! ».